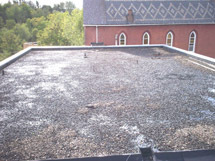 Replace the tired and leaking rubber roof with a watertight roof system. Seal over coping seams. 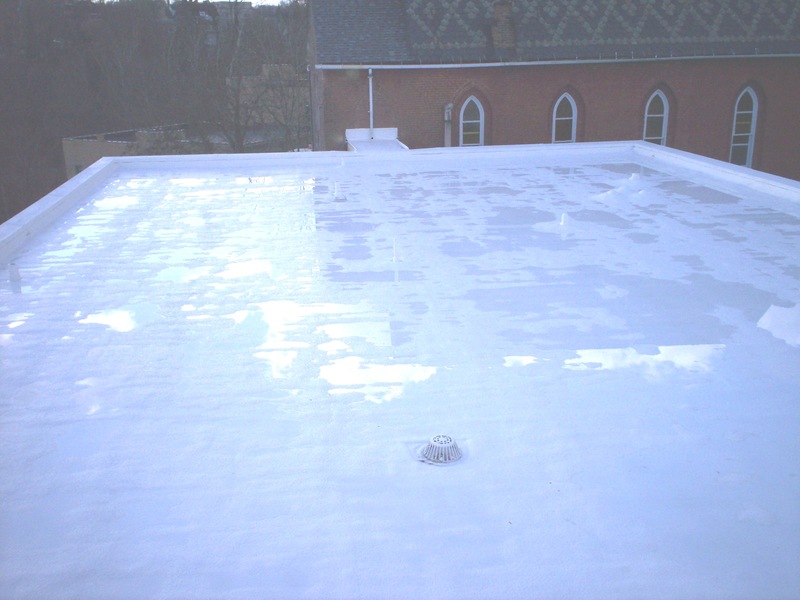 Utilize foam to tie-in various walls, roofs, skylights and other areas to eliminate existing problems. Improve the insulation value to reduce energy costs and provide increased comfort to the inhabitants. In short, redo the roof system so that it helps, rather than hinders, the humanitarian goals of the organization. Late in the season, there was a short window of weather in which to work. There was no parking next to the building and the roof could not be easily accessed to lift materials onto the roof. The Ministry’s services could not be discontinued so the roof replacement needed to happen with minimal disruption. Ministry management was fiscally responsible and, where there was anything possible that they could do themselves, they wanted to do the work to reduce the overall cost. 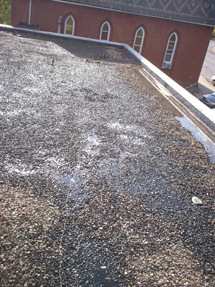 The job was coordinated with Ministry management to allow them to remove the existing gravel. 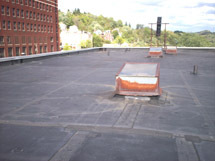 The roof was prepared and insulation board attached over the old rubber roof. Two inches of Spray Polyurethane Foam were applied providing a seamless monolithic surface, and giving an over thirteen R-Value. Low areas were built up with extra foam to eliminate the two to four inch lakes that had existed on the roof. 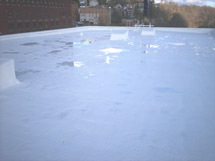 Coping was coated, skylights covered, all protrusions and tie-in areas flashed and sealed against future leaking. 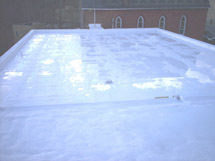 Two coats of Neogard silicone coating were applied over the roof, a dark base coat and a reflective white top coat for potential further energy benefit. Ministry management was pleased that Foamcoat worked with them to achieve their financial and operational goals. The job was completed in a narrow window of good weather with minimal disruption to the ministry’s operation. Leaking has been eliminated. Because colder weather moved in immediately behind the completion, management has already been able to assess the insulation impact and reports noticeable differences in warmth and comfort of dorm areas. They are excited about what they feel will be a significant difference in future energy costs. Maintenance personnel are excited about the appearance, the improved drainage that has been achieved in previous low spots, the elimination of weight that has been achieved by replacing tons of gravel with lightweight foam and the minimal future maintenance requirements of a foam roof.